I recently talked about making decisions through understanding priorities and urgency and then understanding the goals. This week I want to explore taking a systematic approach to decision making. That way you will feel confident in the decision you are making as you’ve explored the evidence and all the facts. With any decision making, there are risks involved. If not all the evidence is discussed and shared or unforeseen circumstances happen then this can affect the decision made. It is a risk that the wrong option is picked but it’s better to make a decision than no decision. And what’s the worst that can happen if you make the wrong decision? You might have to backtrack, adjust the direction of travel and put your hands up that you got it wrong. But that builds credibility to your employees if you admit and apologise for getting it wrong. It’s the leaders who make out they are perfect, who then disengage staff. So with any decision you need to lay out the options and what the evidence is for each option. This will help eliminate some options immediately. Think about what evidence you are using and don’t go with hearsay. I always remember suggesting we stop issuing a letter to agents and just stick to the one letter to the customer, rather than the two, to reduce the process time. Staff said we will get lots of phone calls chasing for the letter. So we agreed we would trial for two weeks not sending the letter out and the staff would report how many phone calls we received from customers or their agents chasing for the letter. Well after the two weeks there had not been one phone call so clearly the letter was ignored anyway. • How much work does the property need to be able to move in as on a limited budget? These primary considerations arise because of the budget, travel from and to work and time to move into the property. If any one of the primary considerations are not hit, then immediately the option is rejected. 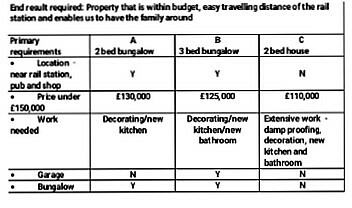 So in this case, the house and the 2-bed bungalow fail, so giving the option to go with. If I had been left with two or more options still after reviewing the primary needs, I would then have reflected on the secondary (nice to have) options. In this case, I don’t need to. If I had used the secondary needs, I could have used a points system to establish the ranking of each option being considered. So for instance, if I had two bungalows that hit all the essential criteria, then I would have awarded 10 points if it had a dining room already or 8 points if it had a bedroom I could convert. If the garden had been medium sized with potential, again, I would give 10 points but if tiny and little scope to landscape to requirements it would have been given 5 points, and so on. The option with the most points, when added together would then be the ultimate choice. 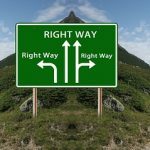 This format of decision making is useful when you are dealing with a major or contentious decisions. It enables an in-depth discussion with the group and allows everyone input. If you haven’t used this format before, give it a go and see what you think. Let me know.